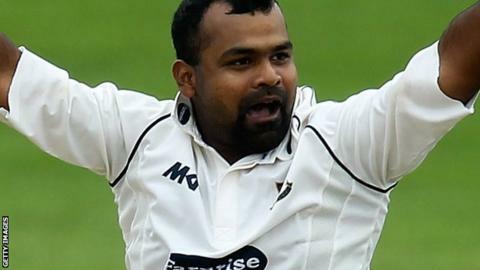 Sussex have taken disciplinary action against Ashar Zaidi following comments made by the all-rounder on Twitter. The 32-year-old has been given a suspended one-match ban after tweeting his reaction to umpire Nigel Llong giving him out against Somerset. In a statement, Sussex said Zaidi had "apologised for his behaviour and regrets his actions deeply" and that they would not be commenting further. Somerset won the match at Hove by an innings and 11 runs. Pakistan-born Zaidi was awarded a two-year deal by the county last November after initially joining them on a non-contract basis from Lancashire league cricket, in which he was the leading run-scorer and wicket-taker in 2013.